Twitxr – Like Twitter, With Pictures. Yeah, It's Photoblogging. FON (better known for building a WiFi community) launched Twitxr today through their FON Labs group. Basically, it’s Twitter but allows picture uploads when sending a message (which makes it particularly useful for camera phones). FON founder Martin Varsavsky announced the product on his blog. So, yeah, basically it’s a photoblog. You can easily set it up to automatically send your messages to Twitter and Facebook too, though, which is useful. My Twitxr account is here. Here’s an example of a message that was copied over to Twitter. Another feature I like is the fact that you tell it where you are, so location information is included. Varsavsky says it’s specially designed for the iPhone, and they’ve created software that makes uploading text and a photo from the iPhone very easy. As a third party application, though, it isn’t officially available for the iPhone. You have to “jailbreak” the phone before you can install their application. It looks like you can’t simply grab a photo that you’ve taken normally from the iPhone, either. You have to initiate the photo through the Twitxr application. The application automatically adds location information to your photos and updates. 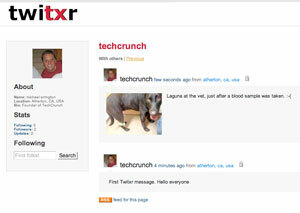 Twitxr is the upteenth variation of Twitter to appear (see Jaiku (acquired by Google), Pownce, etc. One clone has even gone to the deadpool. This isn’t even the first Twitter-variation to include photos – see Zannel . This is something Dave Winer has been working on with his FlickrtoTwitter project as well – which sends links of your new Flickr photos to your Twitter account. And photoblogging is nothing new. So as pretty as Twitxr is, perhaps FON should stick to wifi. Update: I’m actually going to re-jailbreak my iphone to test the software – the fact that uploading is so easy and it adds location information is worth noting. If it works really well, this could actually be a reason for me to stop posting directly to Twitter.